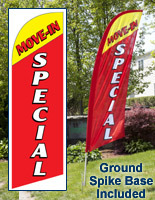 Sale Feather Flags Will Help Move Inventory Faster! Make Sure Everyone Who Drives By a Store or Property Knows a Special is Taking Place! 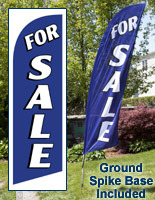 The Sale Feather Flags are One of the Most Effective Ways to Generate Interest! 8' Height and high contrast colors for visibility. 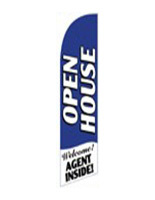 These outdoor displays are sale swooper flags that are easy to transport to a different location on daily basis if need be. 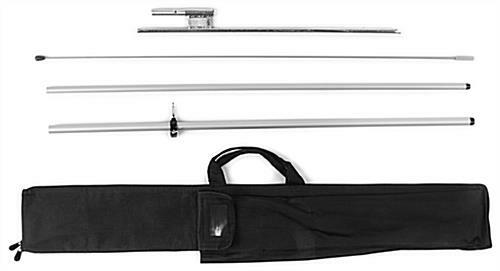 The purchase of this promotional outdoor banner includes a black nylon carrying case, ground spike base kit, pennant and pole. Inside the bag, there are separate compartments for each component of the 8' sale swooper flags. Each pole consists of (2) aluminum and (2) fiberglass segments, and assembles in only seconds. The sale swooper flags are connected to the pole by a bungee cord so the pennant stays securely in position during wind gusts. Once assembled, the feather banners are 8' high, which is the perfect height to balance easy assembly, portability and an eye-catching design. 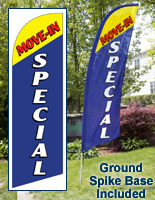 The swooper flags that are 8' tall can be positioned practically anywhere there is grass. A steel construction makes the ground spike durable for repeated use at different locations. 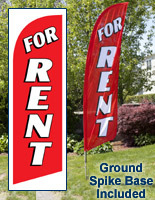 These sale swooper flags are ideal for real estate agents or businesses that frequently attend outdoor events, as the banners require only 1 person for setup and easily fit in the trunk of a vehicle for transport! 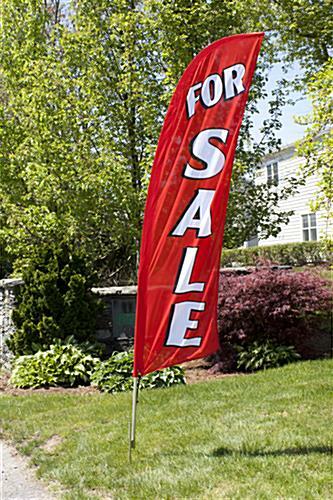 The sale swooper flags that promote homes are fabricated from a poly knit fabric for a lightweight and stretchable design so they can be pulled taut by the included bungee cord. The slogan is printed in bold white lettering on a red background. 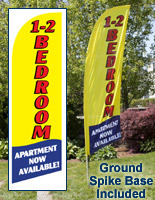 The sale swooper flags have a high contrast with the white lettering, making the unit easy to read. The generic message is ideal for notifying the public of all types of items available for purchase, not only residential and commercial property! 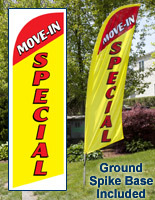 While these sale swooper flags are inexpensive, the quality of each unit is maintained to meet the needs of use in busy business environments. 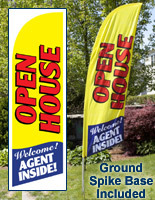 Sale swooper flags have become very popular for all types of advertising and promotions because of just how effective they are. This particular line of 8' tall feather banner combines the proven advertising campaign of the flutter flag with all the portability and convenience of smaller displays.